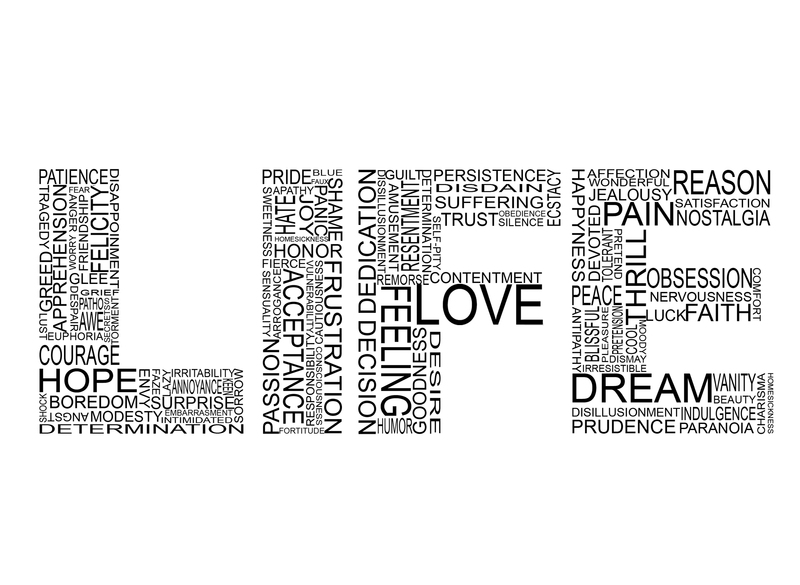 “Life” is a fine word. But it’s not what I chose. Every New Year’s Eve, one of my friends and her sisters each choose a word they intend to make their personal theme for the new year. And despite my tendency to be impulsive, I wanted to put some thought into it. I wrote down different words all night. A quiet New Year’s Eve at home. There may come a day when I will leave my son with a sitter during the 50 percent of his life that I get to see him now. But it was never going to be in 2013. So, I skipped the parties this year on what is traditionally my favorite party night of the year. This is my first New Year’s Day not feeling hung over in, literally, as long as I can remember. I didn’t have a drop last night. I set my alarm clock to wake me at 11:45 p.m. With my son asleep next to me, I watched the television coverage of the ball dropping in Times Square. All I did was think about who and what I want to be. How I’m going to use 2014 as the springboard to the rest of my life. What word would I choose? So many of you are writers. So you know they matter. While I’m forever guilty of writing quick first drafts and clicking ‘Publish,’ the best of us pore over each sentence on the really important stuff. Each word. Once in a while when I’m writing at work, I’ll pop open the thesaurus. I rarely use it, but once in a while, in marketing, I believe the perfect word is out there waiting for us to find. The magic words. The hypnotic ones. The ones that sell. Is that thing good? Or is it delightful? Is that product durable? Or is it robust? Is that woman pretty? Or is she exquisite? Ravishing? Bewitching? Angelic? Choosing words isn’t so different than choosing the perfect seasoning for your food. Or choosing the optimum wine to drink with it. A Barolo or Cabernet Franc? A Pinot Noir or Zinfandel? They are all red wines. Good ones. But they also all have their own unique personalities and characteristics. Not unlike my list of words. Many of them mean almost the same thing. All of them play nicely together. I want to choose wisely. Get it right the first time. The perfect word. “Hope” is my favorite word. And it’s my favorite idea. Hopelessness is a disease I never intend to contract. There is no situation, good or bad, in which I can justify abandoning hope for a better tomorrow. The anticipation of an amazing thing is one of the underrated experiences we are allowed as human beings. And with hope, I am always trying to feel that anticipation. That childlike feeling of eagerly awaiting something magnificent. I feel it more, right now, than any other day I’ve written here. Call it foolishness. Say January 1 is just another day. You’re entitled to that. But what I see is a fresh canvas. A blank sheet of paper. A clean slate on which to start a journey. Hope lives in all that white space. In the unknown. And I am drinking it up on this quiet, snowy morning. But as a guy who values efficiency—two birds with one stone, and all that—my word for 2014 is: Achieve. Because achievement can only occur if I actually grow and display that growth through my daily actions. It’s a good word. It’s not exotic. It’s not big. Everyone knows what it means. And it covers every facet of my life—the four pillars of balance, like legs on a table. One puts in the right effort into each leg of the table, and you have something balanced. Something sturdy. Perhaps even something beautiful. I may not meet all of my goals for 2014. But there absolutely will be achievement in this new year. As always, I will look forward to sharing them with you. What word might you choose? Wishing you a very happy and blessed New Year. And for all those you love. And for all those they love. I hope you’re having a beautiful, hopeful day. As I am. I’m grateful for the smiles you deliver. Achieve – it sums up everything. That’s a great word, Matt. I suppose mine would be, live. I’m quite sure you deserve that. Thanks, Matt. I sure plan on it. Here’s to a great 2014 full of life, hope and achievements! Great list of words, so many to chose from. My 2014 word is Consistent. This is my first year participating in One Word arena and am excited to see how the year unfolds…one day at a time. I wish you all that you “hope” for in the coming year and receive more than you could imagine. My best for a great 2014!!! Consistent is a wonderful word. Particularly when things are consistently improving. My word before I read your list is Hope. That is what I want to hold close in 2014. Hope for a better today, hope for a better tomorrow. I know I will achieve. I have goals, dreams. Hope is like the gasoline that fuels the desire to take action towards the goals. Nothing will stop me…I left all the negative thoughts and feelings back in 2013. I love that you rang in the New Year with your peacefully sleeping son. I didn’t have a drop last night either. I am so happy I made that choice. It’s such a perfect thing, hope. Nothing can kill it. It can thrive in the harshest of environments. In 2012 I had a complete breakdown and attempted to end my own life. 2013 was a year of recovery, learning to deal with my past and finding ways to cope with the future. My word for 2014 has to be ‘dreams’ because for the first time in a long time, I finally have some and can move towards fulfilling them. Thank you for being here. I admire your bravery and your strength to choose hope very, very much. Here’s to 2014. I’m so grateful that you’re here to read this and say hi. Thrive is a wonderful word. Switchfoot has a a really nice song called “Thrive”–he wants to thrive, not just survive. Conquering fear is a wonderful human achievement. You’ll feel amazing once you do that. I really wouldn’t have thought to put it into one word, but after viewing your list I would have to say the one that stands out to me…that seems to incorporate what I am looking forward to this coming year would be Discover. It’ll be fun to see how that word unfolds for me. While I wouldn’t want to encourage anyone to limit themselves to my tiny list, I would never begrudge you the opportunity to choose Discover. Same to you Matt! It’s gonna be a good year…filled with everything on your list and so much more. I loved this post, thank you for writing it! For me, I think it has to be Courage. Not a verb, I know! Courage is a beautiful word. Thank you for sharing. Hope always but for 2014: fortitude. Happy New Year to you too good sir! Mine is “healing.” After a broken leg and broken engagement in 2013, I have some significant mending to do. Be well, Matt. Decided today to change mine to Stay Strong. Thanks again for this post. Obviously it has me thinking. And I wish you the best in 2014. Believe. This is the year I believe in myself, my family, my future… I believe I can be not only better, but the best I have ever been. I believe I can stop being bad, and be very, very good. :) I believe in me. As always, Matt, you are an inspiration. Thank you for being such a great writer and sharing your life with us. I like your word, and I Believe you can achieve anything you set your mind to. I never make New Year resolutions, but choosing a word for a new year makes sense to me. I thought about this on my plane trip back home yesterday and decided that I should first find a word for the last few and then pick. I just read the book “Secret HERO” by Rhonda Byrne, so I decided to make a big optimistic choice for this year. Blissful is a good word. One that means everything is going right. And that’s exactly what I wish for you. I’m glad you said hi. Thank you. I’m very happy you found this place. Made me smile this morning.